ID has sourced the best and most easy to use tools on the web. With its user-friendly control panels featuring cPanel®, our Hosting puts you in charge. And thanks to our award-winning data centers, lightning-fast load times and 24/7 monitoring, you know your site will always be safe, secure and online..
Set up you server now! If you’re outgrowing your virtual private hosting and you want to take your hardware to the highest level, then a managed, fully dedicated is the only choice for your hosting needs. 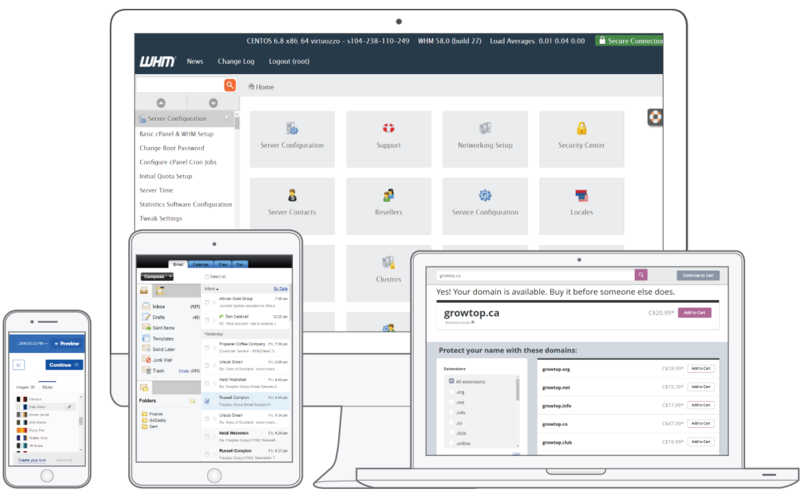 It gives the same flexibility that a managed VPS server environment with 100% of the servers' resources dedicated to you. On a dedicated server there is more responsibility involved in the day-to-day management so this option should be reserved for only the largest of server tasks. Redundant Array of Independent Disks (RAID) is a means for storing data on multiple hard disks, then linking the disks so that the operating system on your server views them as a single entity. We offer RAID-1 with our dedicated server hosting. This RAID method of data storage is known as mirroring. Data is written to at least two disks, which offers a high degree of data security. Set up your Dedicated Server now! Each and every Independent Development domain name comes with all you need to get online. Register 5 or more domains and get FREE Private Registration! Sucuri protects your web investment, keeping you and your customers safe from hackers and other online threats. Every time shoppers place an order, they’re trusting you to keep them safe from hackers who steal information or spread spyware and viruses. Deliver on that promise with Sucuri. It not only finds malware but the security gaps hackers use to break in. Sucuri scans your website to find malicious software (malware) before it can harm you or your customers. Hackers insert malware onto legitimate websites in order to steal customer passwords and credit card numbers, deface or destroy the website or use your server to launch attacks on other websites. Get Your Sucuri Subscription Today! Seamless integration with other Independent Development Workspace products, including Email Plans, Online Calendar and Fax Thru Email. Access your Independent Development Email address book from Online Storage for a fast and easy way to share files with friends, family and co-workers. Easily add attachments to your Independent Development email with a built-in button to get files from Online Storage. Add File Sharing To Your Email Today! Get SEO Optimizer For Your Business Today! Email outperforms other marketing strategies, earning C$56 for every C$1 spent on average.+ It’s the most cost-effective way to gain new clients and keep existing ones coming back. Easy-to-read dashboard shows you which emails are most successful based on the number opened, and whether or not the reader clicked on links or shared your email with friends. Over time, these statistics will tell you what does and doesn’t work with your audience. Handles routine emails such as password resets, account activation and purchase orders. Get HTML Email Marketing For Your Business Today! Set Up Your WordPress Blog Today!